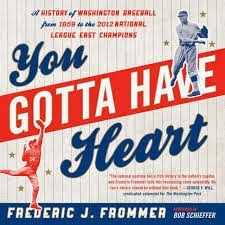 Frederic J. Frommer, a reporter for the Associated Press, is the author of the new book You Gotta Have Heart: A History of Washington Baseball from 1859 to the 2012 National League East Champions. His other books include The Washington Baseball Fan's Little Book of Wisdom, and Red Sox vs. Yankees: The Great Rivalry, written with his father, Harvey Frommer. He is based in Washington, D.C.
Q: Why did you decide on "You Gotta Have Heart" as the book's title, and is the story told in Damn Yankees still relevant to the current Washington Nationals and their fans? A: My publisher actually came up with the title in a nod to Damn Yankees, a play and movie about a middle-aged fan who sells his soul to the devil so he can be turned into a 21-year-old slugger who leads the Washington Senators to the American League pennant. The manager breaks out in song, “You Gotta Have Heart,” about the need to play the game with passion. 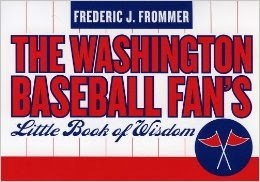 Q: What particularly surprised or fascinated you as you researched Washington's baseball history? A: A couple of things come to mind. One is the tradition of presidential first pitches, which dates back to 1910. Fans are accustomed to seeing presidents throwing out the first pitch from the mound, but in the 20th century, presidents would throw out the first pitch from the stands, over a scrum of photographers and into a crowd of players from both sides, who would battle for the ball like bridesmaids trying to catch a bouquet. The winner would get the ball autographed by the president. My book has details on presidents from Taft to Obama throwing out first pitches. Another is how the city got so excited by Washington’s only World Series championship, in 1924. A newspaper story at the time said fans were so riled up that half the city’s population was in danger of dying of a heart failure. Fans were especially excited to see Walter Johnson, the future Hall-of-Fame pitcher, finally get a chance to pitch in the World Series. Johnson actually lost his first two starts in the series, but came out of the bullpen to win the seventh and deciding game in extra innings against the New York Giants. Fans celebrated downtown that evening by blowing whistles, shaking rattles and honking horns. Cars were forced to drive on streetcar tracks as thousands of people jammed Pennsylvania Avenue. Q: What would you say are the high and low points for the Nationals since they arrived in Washington in 2005? A: The low points were the 2008 and 2009 seasons, when the Nats finished with the worst records in baseball. But those seasons also had payoffs for the Nats: the top draft choices, which yielded Stephen Strasburg and Bryce Harper. Strasburg’s first start was definitely a high point, when he struck out 14 hitters in 2010 in a playoff-like atmosphere, even though the team was not a contender that year. And of course, the 2012 division title represents a high mark. Q: How do you think the Nats will do this year? A: The Nats are poised to contend for the division title again this season, and have a decent chance of getting to the World Series (which would mark the first World Series appearance for a Washington team since 1933). I think that last season was just a down year. With a solid nucleus and an improved rotation, the Nats can repeat, and possibly exceed, their 2012 success. Q: Are you working on another book? Anything else we should know? 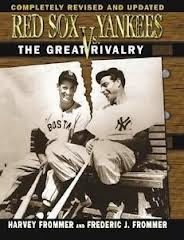 A: My father and I have a new edition of our book, Red Sox vs. Yankees: The Great Rivalry, coming out this year. Also, I plan to do some Washington book events in the spring. Your readers can watch for updates by following me on Twitter, @ffrommer, or liking my book’s Facebook page.